People spend more than 90% of their workday indoors. It makes sense that companies are committing to improving the health, well-being, productivity, and happiness of building occupants. The WELL Building Standard addresses how a building can be genuinely sustainable and the occupant experience should be measured as rigorously as energy savings. While it is difficult to assign a monetary value to something so abstract, ratings like the newest "WELL Certification” have devised demonstrable ways to determine how green buildings ultimately improve employee health and wellness, along with financially benefiting an organization. The WELL Certification, established in 2014, is the result of seven years of research and collaboration between leading scientists, doctors, architects, and wellness thought leaders. This rating system was created by integrating scientific and medical research on environmental health and behavioral factors that affect health with leading practices in building design, construction, and management. The WELL Building Standard applies to buildings, interior spaces, and communities seeking to implement, validate, and measure features that support and advance human health and wellness in seven categories: clean air, water filtration, fresh food offerings, natural light, exercise, optimizing comfort, and cognitive and emotional health. There are some differences between LEED and WELL Certifications. LEED focuses on the conservation of resources through buildings that are beneficial to the environment. WELL concentrates on how structures benefit the people who occupy them by enhancing their health and wellness. The WELL Building Certification requires on-site testing and assessment of sustainable features; something LEED had not incorporated until most recently when they launched LEED v4.1. This site visit accompanies letters of assurance from appropriate professionals overseeing the implementation of specific WELL features during design, construction, and operation. As of December 2018, 1,162 projects encompassing over 231 million square feet of real estate was registered, pre-certified, or certified under WELL in 43 countries worldwide. The certifications will undoubtedly continue to increase over the next several years. WELL Certification supports a sustainability marketing narrative and provides a competitive advantage in attracting new tenants as well as top employee talent. Building and business developers, owners and operators, facility managers, and corporate and residential tenants have become aware of the return on investment for healthier employees and residents and, in turn, are committing to design spaces that can attract and retain this sought-after workforce. Ekta Khuller, LEED AP, WELL AP is an Associate and STG Design's Sustainability Design Manager. With nearly a decade of experience in sustainable design both in Arizona and Texas, Ekta has spearheaded STG’s sustainable design department to ensure each project meets or exceeds its goals for LEED or Austin Energy Green Building. To find out how the WELL process works, contact Ekta. Hiring a commercial architect can often be intimidating. Even experienced clients struggle to differentiate between firms and understand the value that each one brings. Know-how on similar projects is vital, but once you’ve created your short list of firms, how do you decide between them? A local firm may have a better understanding of jurisdictional issues, but a larger firm may have more substantial resources to bring to bear. A more sophisticated firm may have better visualization and communication tools, but a smaller firm may be able to focus on your project more wholly. While these are all important considerations, the most critical factor is the quality of the partnership you will develop with your architect or designer. On a ground-up project, you may be working closely with the design firm for three years or more so it is critical to select a firm that is a good fit. The key to successful relationships begins with a deep understanding of client's needs. In his seminal book, Good to Great, Jim Collins argues that every company should have one thing that they do best. For architects, that one thing could be project-type expertise, design, or technical competence. For example, an architect that only designs elementary schools will bring a depth of knowledge about the latest thinking in school design and the practical execution of that knowledge, just as a “high design” firm will likely bring a particular aesthetic to every project they do. Similarly, a firm that prides itself on technical execution can deliver projects quickly and economically that are highly constructible. Each of these will appeal to individual clients who see the value proposition of the particular expertise. While clients compliment our firm's design and technical prowess, what the STG Design team strives to be the best at is understanding the broader goals of our clients. Using a process we call Visioning and Imaging, our design team digs into a clients’ underlying objectives for their projects and allows us to develop an in-depth understanding of their needs. With the insights from this process, we use built space to create more successful solutions to the unique challenges each project represents. Because our clients know that we understand their big picture, we can push design, creating beautiful, functional spaces that are unique to each client and their specific challenges and goals. While working on Oracle’s new Austin campus, our design team used the Visioning process to help Oracle's team clarify and articulate rigorous and detailed goals. At a high level, their leadership knew they wanted the new campus to be a magnet for recruiting as well as showcase their latest products and technology. First, they wanted to attract and retain young professionals by creating a work environment that was exciting, interactive, and personalized. Second, they wanted the campus to be firmly connected to Lady Bird Lake and the surrounding areas and to “encourage the movement of energy and people throughout the space.” Lastly, they wanted the public spaces of the building to set the stage for and reinforce the message of their sales pitch for cutting-edge solutions. These goals informed every design decision the design team made; from siting the building to the material for the grand staircase in the lobby. Oracle’s campus showcases the love that Austinites have for their city and the natural landscape. The site features several heritage trees, making them an integral part of the path from parking to entry. The building is designed to maximize views of Lady Bird Lake and the skyline of downtown Austin, using structural glass walls to minimize obstructions. STG’s design team recommended a series of terraces and ramps to physically represent the connection between the employees and the nearby lake and trails. Interactive graphics throughout the building allow coworkers to share information and experiences with each other on a variety of ‘best places’ around Austin and central Texas, including best places for swimming, hiking, camping, and eating BBQ. This culture of sharing knowledge is so integral to Oracle’s success that these graphics have become a method of wayfinding throughout the 560,000 square foot campus. Other building components emphasize Oracle’s culture. The radiused corners and the keying of the cantilevered balconies within the glass facade is a nod to the architecture of Oracle’s iconic headquarters in Redwood, CA. The façade of the building is intended to mimic a gentle wake gliding across the building inspired by founder Larry Ellison’s passion for sailing. 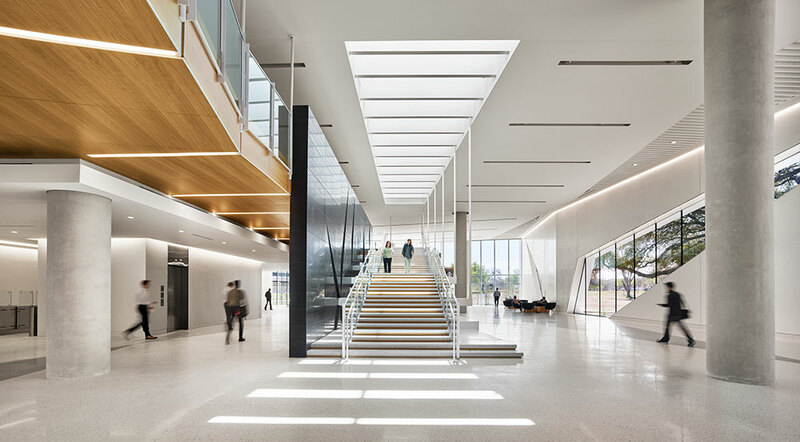 The customer experience from outside through the lobby and into the Customer Visitors’ Center (CVC) keys on evolving forms, sophisticated finishes, and lighting all designed to bring customers in and draw a parallel with the high quality of Oracle products. The first phase has been a tremendous success; Oracle is ahead of their hiring schedule and is moving quickly to execute in the second phase of their campus plan. When our team visits, we’ve overheard employees talking animatedly about exploring their space. They want to experience eating lunch on each floor to see each breakroom and are searching for all the interactive activities like the F-1 slot car races. The development team has frequently mentioned design elements they want to incorporate into other Oracle offices. W. James Hadden IV, MBA, LEED AP is STG Design’s Director of Operation; his passion is to make the business of architecture more efficient. James has a BArch from MIT, an MBA from Duke University and 20 years of experience in the A/E/C world.